Haven’t decided on a hotel yet? 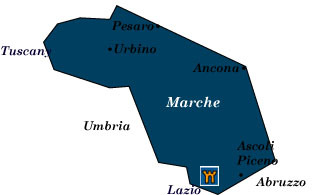 You can look at other available hotels in the Marche region with Booking.com. Between the Apennines and the Adriatic, Marche is less touristed than other regions in Italy. Along its 180 km (108 miles) of coastline you’ll find the usual formulaic beach resorts, but head to the hills to discover unspoiled villages filled with ancient churches and art treasures, rivaling its Tuscan and Umbrian counterparts. The government has established several protected nature reserves, four regional parks, and a national park, which make splendid getaways from Italy’s press of people and congestion. Although buses and some train routes reach the small inland towns, you really need a rental car to get the most out of your visit. Ascoli Piceno Dominated by mountains leading up into the Apennines, this medieval and Renaissance town features a charming piazza (Piazza del Popolo) dominated by a Gothic church and 13th-century town hall. In August the Giostra dell Quintana—a medieval jousting tournament—is held in the old town. Urbino In the 15th century, the court of Urbino, led by Federico da Montefeltro, was one of the most illustrious in Europe. His Renaissance palace, the Palazzo Ducale, is extraordinary and now houses the Galleria Nazionale delle Marche. Urbino is also a lively university town, hosting the Urbino Jazz Festival in June and the International Festival of Ancient Music in July. Grotte di Frasassi It’s been said that the Milan cathedral could fit into this enormous cave—one of Europe’s biggest. Spectacular stalagmites and stalactites are 1.4 million years old. Macerata An untouristy, 10th-century hill town, Macerata has a lively university and hosts the annual Stagione Lirica, one of Italy’s most spectacular outdoor venues, attracting world-class opera stars and performers.